Between our yard and the neighbor, there are five towering evergreens. There’s a massive Oak. In the middle of the front yard is a giant, ancient, Japanese Maple. It’s beautiful. Surrounded by all these trees, our home feels like it’s in the country–private and quiet. I love having all those trees. A couple of years ago, I decided to try to work on this problem. My goal is to get more grass to grow in our lawn. This is a difficult goal, though. I can’t force grass to grow. If I lay sod, the sod won’t take because there’s not enough sun. If I plant seeds, the seeds won’t sprout, because there’s not enough sun. So, what can I do? First, I hired a tree service. I’m not cutting those trees down; I love them too much. But there’s a 3-layer canopy over part of the lawn, and that’s too much. So, they thinned out the Japanese Maple. They removed a branch the size of a tree from the neighboring Oak that that had grown over our yard. They trimmed back the smaller trees. All to let a bit more light through. I can’t make the grass grow, or the sun shine or the rain come. Even so, I’m not without options. I can address the conditions. I can prepare for the possibility of growth. I can do something about the obstacles that have grown between the grass and the sun. I can break up the soil, so water seeps in, and the seeds can take root. I can fertilize. I can rake away the moss. I can even over-seed, making sure that more and more of what I hope for is introduced to the soil. Growth is not an act of will, strength or performance. It is a natural process guided by the Holy Spirit. 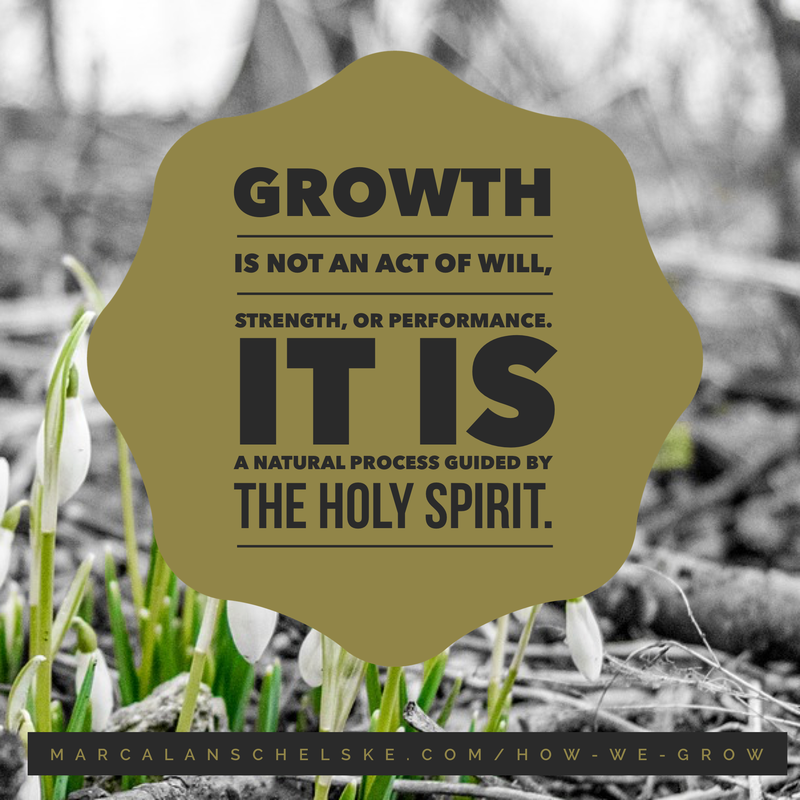 Growth is not an act of will, strength or performance. It’s a natural process guided by the Spirit. “Am I doing enough?” “Am I doing the right thing?” “Am I avoiding the wrong thing?” “Have I overcome that besetting sin?” “Have I served or given or sacrificed…” Questions like these betray a focus on fruit. When we’re focused on fruit, we can easily lose sight of the one thing that actually helps fruit happen—our connection to the vine. In my yard, those awkward clumps of new grass, pushing up through the mud, are exciting to see. They show growth is happening. They are an indication that that, indeed, the conditions are changing for the better. This is what happens when we focus on the condition for growth–staying connected to the vine. Are there areas in your life that are slowly maturing? Take a look at the list of qualities in Galatians 5:22-23 as a starting point. How are these areas in your life changing over time? 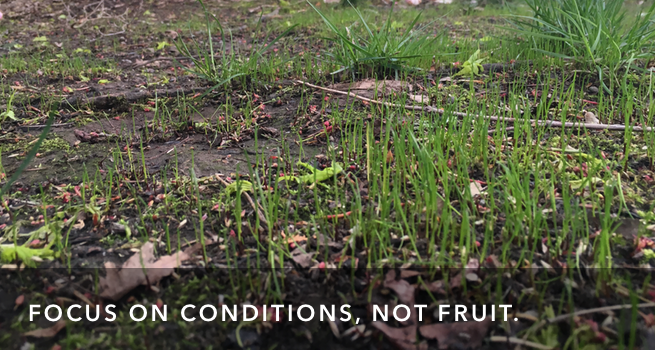 What do you do to prepare the conditions of your heart for growth?